Ryan Hollin – lost one leg in an IED attack and, working with his Mentor, made a career decision to accept medical retirement. He joined Proctor and Gamble’s executive intern program and is now the material manager for Tide product. Greg Gadston – sustained multiple arm and leg wounds in an IED attack. He was serving as a 1st ID Field Artillery Battalion Commander in the dangerous Yamouck region of Bagdad. As a result of his injury, he lost both legs above the knees. Greg’s undaunted spirit and grit is inspirational. He was walking on his C-legs – those high tech computer-driven prosthetics only months after he was wounded. He has been selected for Senior Service College and wants to stay in the Army. Andy Hatcher – While convalescing at Walter Reed National Military Medical Center, Marine Sergeant Andy Hatcher heard about WWMP and met LTC Lee Miller who became his mentor. Miller helped Andy access education benefits available through the GI Bill and VA vocational rehab. With Miller’s guidance, Andy served an internship and was hired by the US Department of Homeland Security, advancing to a senior level there. 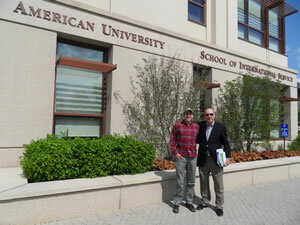 He is now pursuing a Bachelor’s degree in international relations at American University in Washington, DC. The photo at the right shows Andy with LTC Miller. Chris Powell – Chris is currently serving an internship with the Armed Forces Internship Program at the U.S. Senate Sergeant at Arms Office in Washington, DC. Working with his supervisor, Jean McComish, Senior Human Resources Administrator, and others in the Sergeant at Arms Office, Chris hopes to learn more about how to open and manage his own cleaning business after he’s discharged from Walter Reed National Military Medical Center. 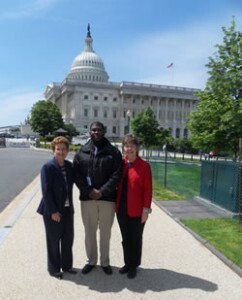 Photo at right shows Chris with Ms. McComish and WWMP representative Cheryl Beversdorf.